The Washington-based fund says we’ve completed our tenth quarterly review under the bailout, with a mixed outlook. THE IMF has suggested that Ireland should not change its plans for the size of the adjustments needed in Budget 2014, despite the impact of the promissory note deal. The Washington-based fund has said the savings generated by the abolition of the promissory notes, which were scrapped as part of the arrangements to wind up the former Anglo Irish Bank, should be used to “build buffers against shocks”. The comments mean it is now virtually guaranteed that the savings from the deal, expected to come in at around €1 billion next year, will not be used to soften the edge of the next Budget, which is expected to cut spending by €2 billion and increase taxes by €1.1 billion. European authorities have already stressed that the savings should not mean more money being available elsewhere, but that the government should instead try to bridge the gap between its income and its spending as soon as possible. This afternoon Fianna Fáil finance spokesman Michael McGrath asked the government to keep an open mind about softening the edges of the next Budget if they had the scope to do so. “If there is any scope there to reduce the burden,” he said, “that scope should be used in a clever and targeted way”. The IMF’s stance comes despite its own claims that Ireland is set to meet the deficit targets laid down for it in 2013, suggesting that Ireland should be prepared for any failure on the part of EU leaders to effectively split banking and sovereign debts. 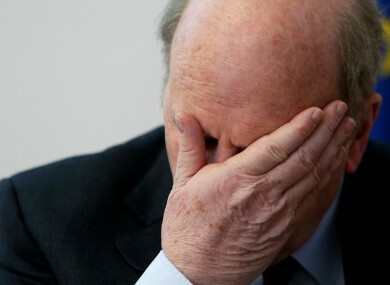 The IMF’s acting chair David Lipton said that if the promissory note savings are ultimately to be used to soften the burden of austerity for the general public, it should only be considered after Budget 2014 lays out plans to introduce €1.1 billion in new taxes and €2 billion in spending cuts. The comments came as the Washington-based fund announced it was handing over the latest batch of bailout loans, making around €950 million available to Ireland after it passed the tenth quarterly inspection of its bailout progress. Including the latest round, Ireland has now drawn down €20.83 billion in loans from the IMF, equivalent to around 93.5 per cent of the total amount set aside under the 2010 bailout deal. The IMF also repeated its warnings that European leaders must follow up on their pledges to split bank and sovereign debts if Ireland is to escape the bailout programme and fund itself independently in the long-term. Email “The IMF wants Budget 2014 to ignore the promissory note deal”. Feedback on “The IMF wants Budget 2014 to ignore the promissory note deal”.